Mahogany hairstyles suit medium and darker skin-tones adding color richness and depth to your hair. 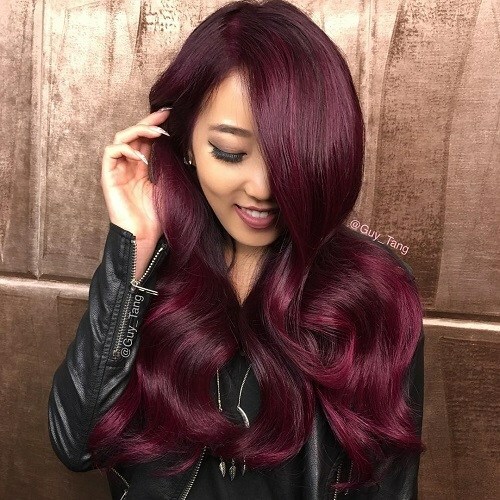 The range of fashionable mahogany shades is broad including copper, dark copper, deep purple, plum-red, violet and lighter red hair colors and there’s a lovely shade to enhance any dark-blonde, brunette or black hair in this super gallery! After being rather neglected, except for blonde streaks that sometimes work and sometimes do not (! 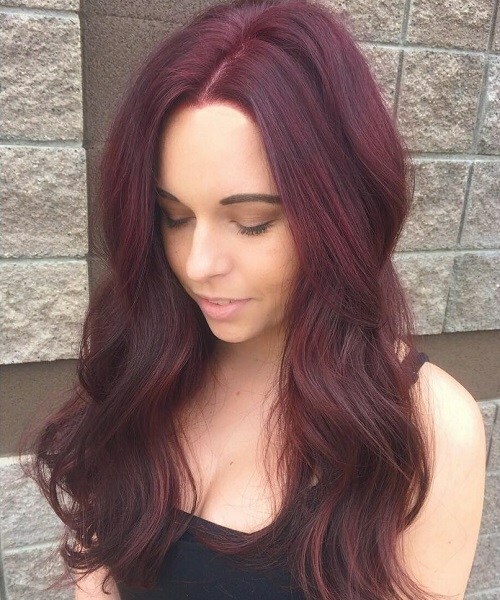 ), black hair is getting lots of new, trendy color ideas this year. 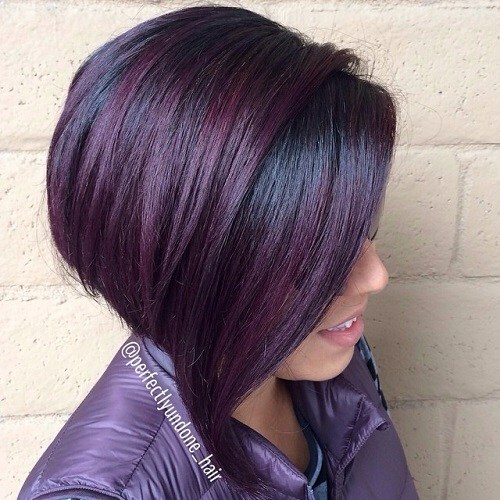 This deep plum shade adds lots of extra class to a fashionable angled bob on thick hair. 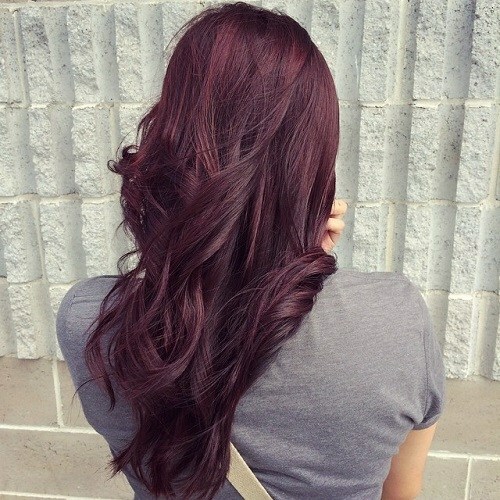 Coffee-brown hair doesn’t have any natural golden or red undertones to soften it and it can look harsh sometimes. 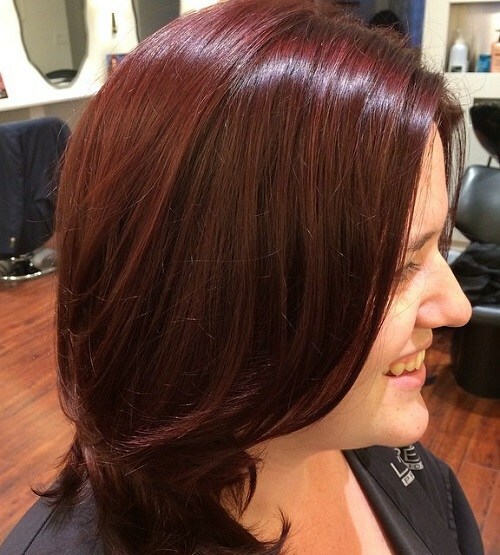 However, adding a hint of red creates a more attractive and flattering colour. This layered haircut has a natural finish with tousled texture and lightly textured tips. 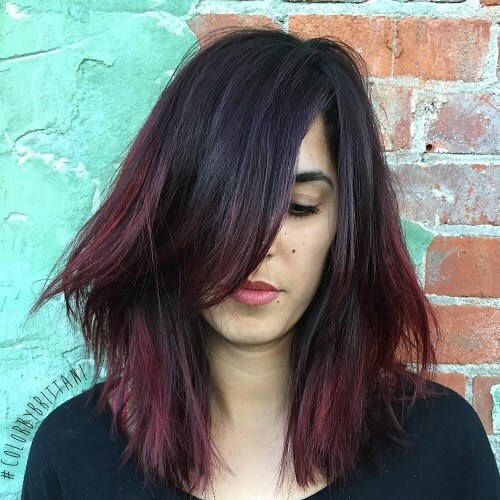 There are lots of edgy, mid-length hairstyles around this season and this layered cut, with muted red ombré and textured tips, is a great example! The smooth, black top has a side parting and extra-long diagonal fringe. In contrast, the lower lengths are heavily graduated and tousled for a super-cool, messy finish. 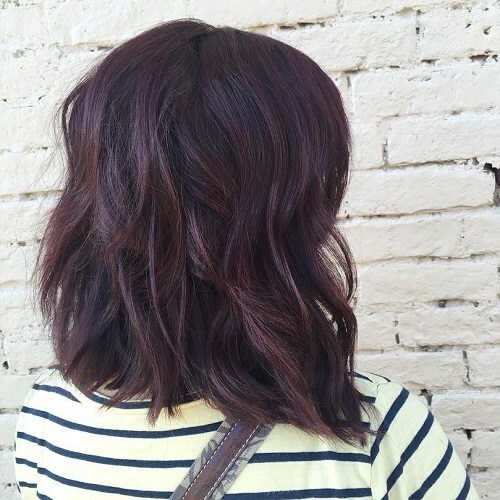 The long, casual layered haircut has a subtle color contrast between the medium-brown mahogany shade and the subtle ombré. Warm tones frame the model’s face and a couple of relaxed, defined waves add texture. The ombré is a couple of tones darker with a trendy touch of ash-brown. This lovely long bob is a highly fashionable choice that transforms long hair into a trendier look with more sophistication. Ripple waves starting on top look soft and natural on either side of a center part. 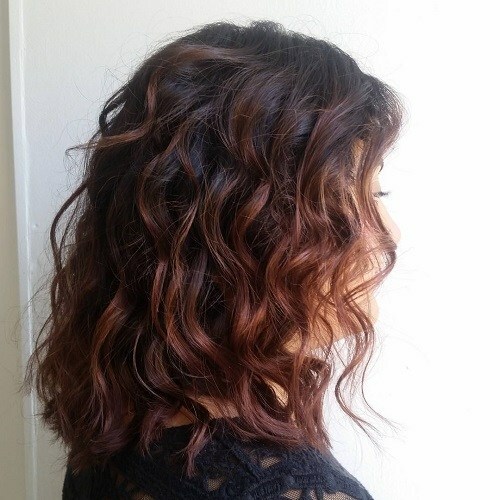 And the flattering colors move from dark-brown roots to toffee, highlighted with rich copper balayage! No wonder this model is smiling at her reflection, the rich mahogany all-over color is gorgeous! 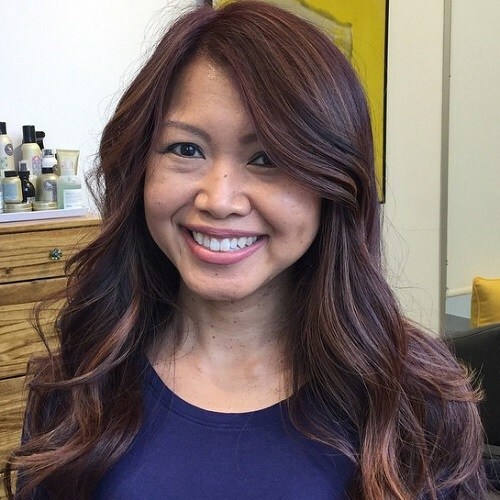 This smooth, mid-length haircut has long layers placed in the last 3-inches and a center-part creating lovely, ‘wing’ waves framing the face! Suits several different face shapes if you adjust the parting. This is a fabulous special occasion hairstyle for long, thick hair. 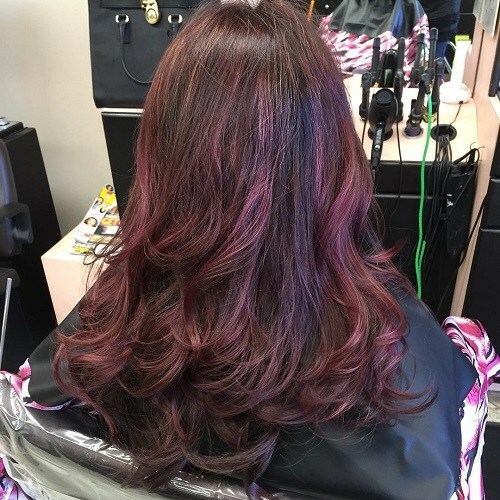 Dark-brown hair has been treated with a subtle red tint creating texture in the barrel waves. Teasing adds an extra touch of sophistication at the crown and in the appealing side-swept bangs in a softly draped wave accentuating the eyes and mouth. 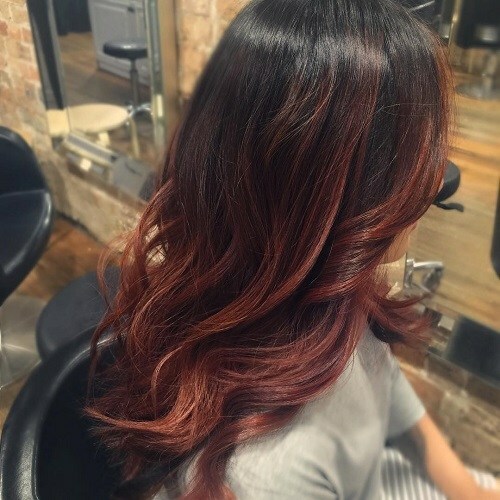 Here’s a beautiful, eye-catching combination of fiery copper ombré and face-framing balayage! 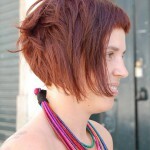 It transforms an ordinary-looking long, black haircut into an easy-care, trendy new look. Copper can really warm-up your complexion and this hair color design looks wonderful in pony-tails and braid up-styles! These large, defined waves create fabulous texture and movement on long hair cut into long layers. It’s one of the appealing, new wave-patterns designed for teens and young women seeking an edgy, individual look. The style is never brushed through, but raked with the fingers to keep the ‘undone’ style, and the tips are textured to give a spiky finish at the ends! This is a high-maintenance beauty image, including false eye-lashes and false nails. It certainly shows how far the black leather jacket has come, since its early days as biker gear! 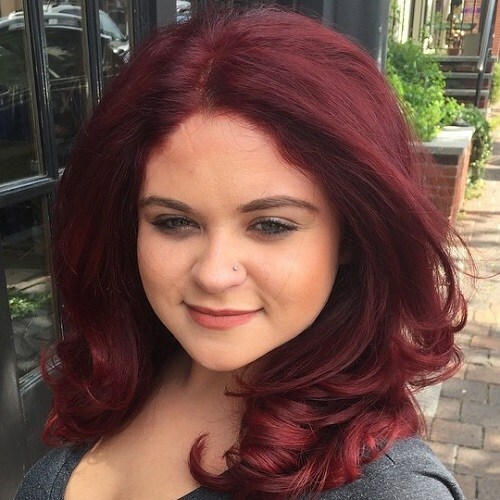 This model’s thick, hair has been expertly tinted burgundy, including lighter fuchsia pink and black tulip burgundy, creating a fabulous, film-star look! 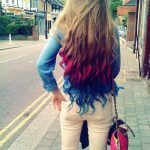 For contemporary color sophistication on black hair, why not try this fantastic blue and red hair color scheme! 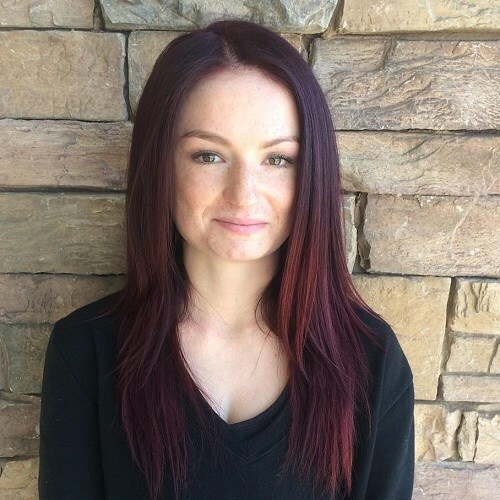 The roots are natural-black that gradually changes to subtle red with deft touches of dark-blue balayage. 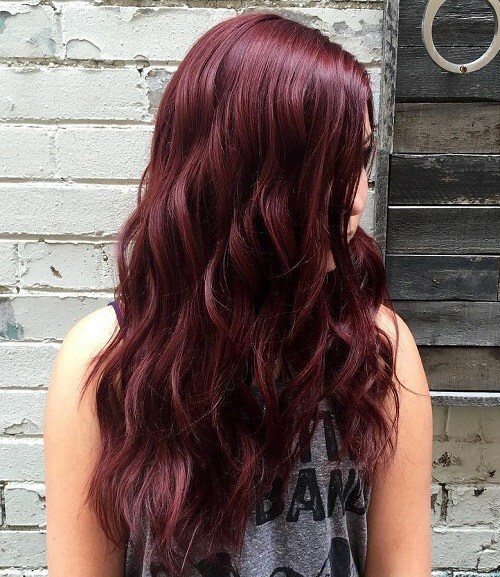 On glossy waves, it looks very rich and appealing without losing the natural look of your long hair. Dark coffee and black hair can start showing white and grey hairs far too early in your life! But with today’s fashionable highlighting, you can turn that to your advantage by getting soft beige-blonde highlights. Beige is a very appealing and fairly neutral shade, so you’ll still have a natural look. 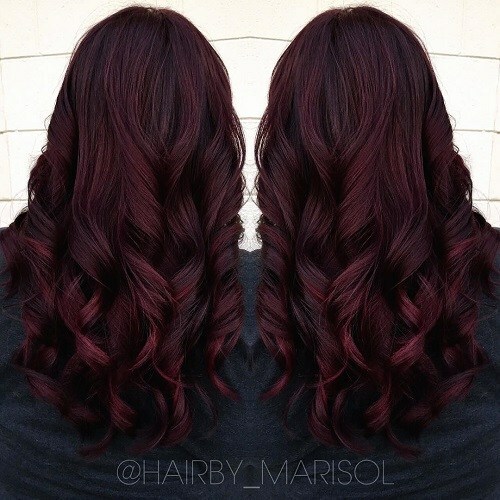 Deep red looks great on healthy, straight hair cut in an easy-care young style with long layering and textured tips. 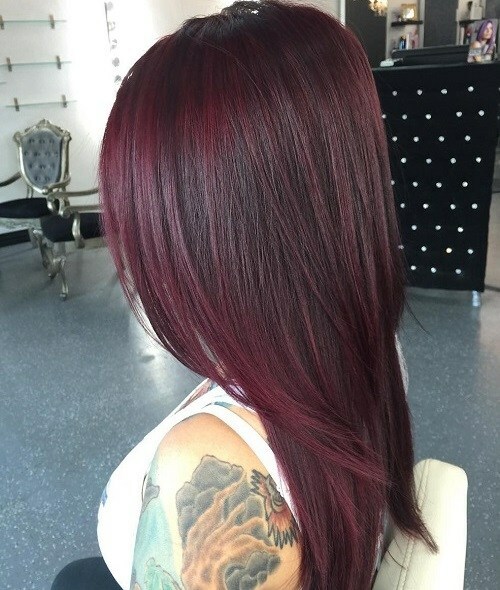 These days, it’s a good idea to consider how a new hair color will look against your body tattoos. The red and pink tones on this model’s arm are nicely complemented by the dark red hair color. This front view of long hair with layers and textured tips has an off-centre parting neatly cutting-off the edges of a square forehead, creating an oval frame. Shorter side layers drape over the square jawline concealing the angles. Finally, sleek sides with long hair are the perfect way to add ‘length’ and reduce ‘width’ to flatter a square face shape! There’s something about deep red that always suggest luxury. And this special occasion hairstyle with beautifully curled, long ringlets is a super-feminine and sophisticated look. 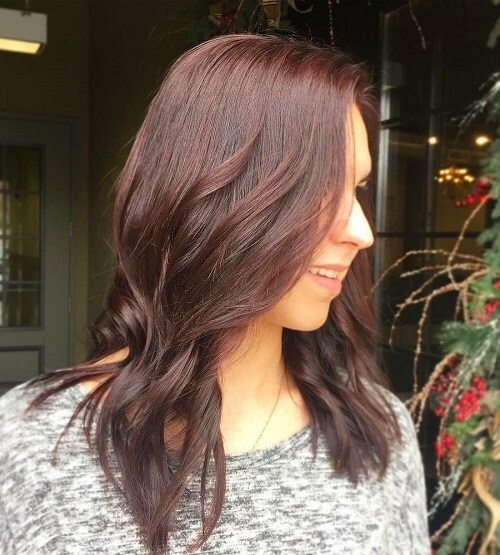 When you change dark-brown or black hair to a deep-red shade, it becomes lighter and will reflect light better creating gorgeous color depth and texture! This model’s heart-shaped face has width at cheek level, so needs a balancing haircut. An off-centre part allows hair to cover the edges of a wide forehead, creating an oval line. 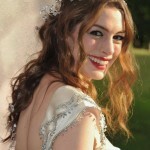 Plenty of volume around a narrow chin ‘widens’ it, but extra volume at cheekbone level will just emphasise wide cheeks. Sleek sides would be more flattering! 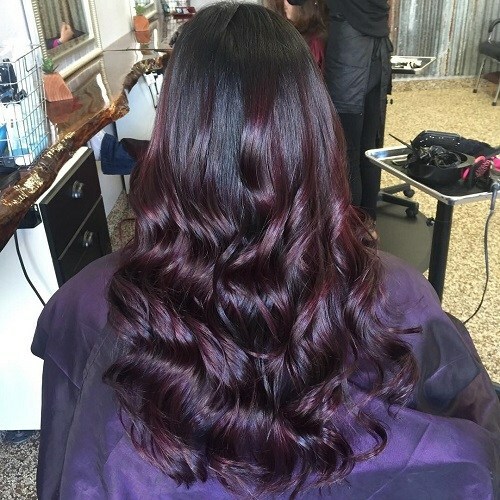 Purple and gray are both hot fashion colors for clothes this year, so it makes sense to choose this lovely deep violet shade to create an attractive overall image. The lightly windswept finish creates loose waves that catch the light for thicker-looking hair with movement, texture and color depth! Here’s a pretty style based on long layers around the head and then close-set layers at the tips. The light wave-pattern around the ends adds lots of texture, density and lively movement. 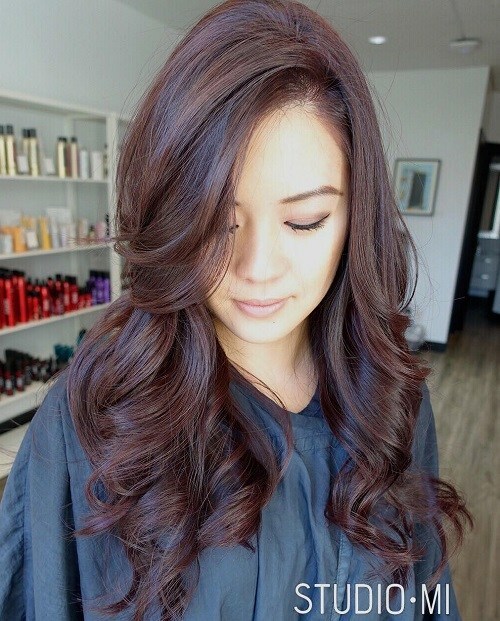 This lovely hair color idea also has light- pink balayage added to the waves, in a style that’s full of ideas to make fine/medium hair appear thicker! This center-parted hairstyle suits an oval face, emphasising the perfect symmetry of a shape that needs no extra balancing. The extra-large waves are trendy and draw attention down to your décolletage. And softening the look even more are fine, beige highlights, added to hair below the chin, to accentuate the wave pattern! Long fine hair drapes like threads of silk and there’s no better way to show this off than tousled waves! 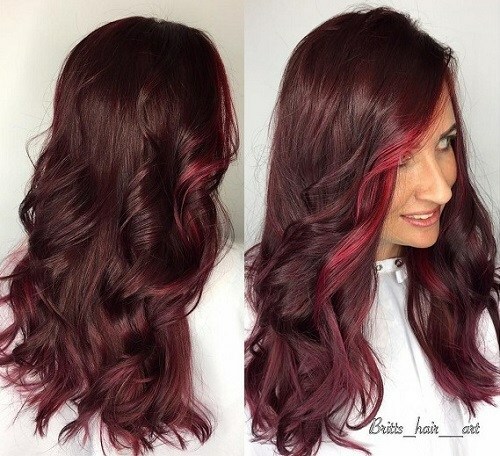 This gorgeously feminine look has cute raspberry-pink balayage, moving down in a wavy line that highlights the eyes and mouth. Diagonal bangs on long hair suit round, heart, oval and square faces ‘lengthening’ a wide face! How many of these fantastic, warm and face-flattering mahogany hairstyles will you be trying this year?